The Bassette as a standard breed was created from birds of good laying abilities found around the South-Limburg and Liège region in Belgium at the beginning of the twentieth century. Although the name Bassette had been used to describe the local poultry population many years previously, it was Mr. W. Collier who standardised the breed as an excellent small laying fowl, first exhibiting it in 1917. The breed very nearly became extinct after the Second World War. The few remaining birds were brought together at Gendt University and the breed was saved. However, locating available stock may still prove problematical. However, as no truly Large Fowl is in existence, it could just as well have been placed in the True Bantam section. 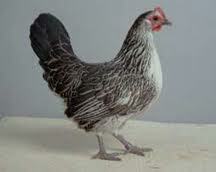 The Bassette stands as a half-size breed, part way between a Large Fowl and a Bantam. Selection on egg-laying capacity formed the basis of this breed. The Bassette only showed one-third of the feed intake of a large chicken, while on the other hand the average weight of an egg is two-third of that of a large chicken. This means that if a Bassette hen is mated to a rooster of a heavy broiler breed, the result of this mating is fast growing chickens with low feeding conversion.